Do you have a member of your family or someone you know whom has always wanted to take firearms training but never acted upon it? Do you want to give the gift of knowledge, safety and awareness to someone? 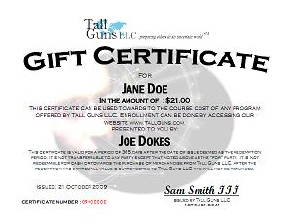 Tall Guns offers our gift certificate program that allows you to buy one of our gift certificates for someone. The pull down menu on the PRODUCTS page list the various denominations for the certificates. These can be applied to any course that we offer, concealed carry, NRA, TASER, NRA RSO or NRA Instructor and is valid for 365 days after the date of issue.Date of issue is 5 days after the date of purchase. The market price at the time of enrollment to the course will be used. You can specify a name to be pre-printed on the certificate or left blank to allow you to fill out at your convenience. This is an excellent way to provide employee incentives, a gift to a loved one or any one you feel would value such a gift. You can buy by selecting the certificate value or specifying one and following the prompts during check out.